All of Oregon’s forests – whether they’re mostly new growth, old-growth or somewhere in between – provide habitat for wildlife. Historically, windstorms or fires created openings in the forest that eventually regrew, leading to a mosaic of different tree ages across the landscape. As a result, some animal species are dependent on young forests, while others thrive in middle-age or older forests. Young, open forests, for example, are especially important for migrating songbirds, while older forests are vital to species such as the northern spotted owl. Natural forest openings contain standing dead trees called "snags," patches of live trees, and down logs – all of which offer important habitat. Timber harvest also creates openings that are used by many species, and state law requires that down logs and some standing trees be left behind for wildlife. Wildlife biologist Fran Cafferata Coe explains the best parts about being a wildlife biologist in the Pacific Northwest, and how all landowners - big and small - need to account for wildlife when considering a forest management plan. Loggers and landowners must leave at least two live trees or two standing dead trees (snags) per acre of harvest. Each tree must be at least 30 feet tall and 11 inches in diameter. Snags provide homes for owls, woodpeckers, bats, squirrels, wood ducks, raccoons and many other animals. More than 50 species of birds and mammals use snags for nesting, feeding and shelter. Logging crews must leave at least two logs (each measuring at least 10 cubic feet) on the ground per acre. Rotting logs are home to hundreds of species, including amphibians, reptiles, birds and mammals, not to mention insects that are in turn food for other animals. Trees and down logs don’t have to be left in each acre. They may be combined into small groves and are often left near streams, lakes or wetlands. The Oregon Department of Forestry can require that a harvest be modified to protect sensitive wildlife sites, such as areas actively used by bald eagles, osprey, northern spotted owl and other species of concern. Join Mike Cloughesy and Nicole Strong as they explore the requirements of the Oregon Forest Practices Act when it comes to animal habitat. During a harvest operation, live trees, dead trees and big down logs have to be left to become homes for various species. How many of those trees depends on the size of the harvest. Just as the Northwest is known for forests, it is also known for salmon. The two are inextricably linked. Adult salmon and steelhead return from the ocean to spawn in forest streams that are sometimes narrow enough to jump across. In the same way that we protect drinking water, fish habitat is protected in a working forest by leaving protective buffers on each side of streams. Inside these buffers, harvest is either limited or restricted. Buffers provide shade to keep the water cool and can range up to 100 feet wide, depending on the size of stream. As the trees age, they eventually will fall into the stream. This is a critical part of quality fish habitat, as it creates pools and shelter. Meanwhile, other vegetation in the buffer allows for a healthy population of bugs that fish eat. Join Mike Cloughesy and Nicole Strong as they look at how loggers and forest landowners are protecting fish habitat. In Oregon, there are programs in place that foster the improvement of fish habitat in working forests to help support populations of fish such as wild coho. To best preserve long-term fish habitat, Oregon has adopted a three-pronged approach, based on two distinct laws and one highly effective voluntary program. To keep fish habitat viable, Oregon’s land use planning and zoning laws ensure that forestland remains as forestland. Forests provide better habitat for salmon and trout than land that is converted to residential, commercial or agricultural uses. Oregon’s forest practices laws, such as the buffer requirements described above, work to protect water quality and habitat during harvest in private forests. These protective laws are based on extensive scientific research, and they likely will continue to evolve as we learn more. In many cases, forest landowners not only play a role in protecting fish habitat, but also help improve it by taking on voluntary projects in cooperation with the state’s unique system of watershed councils. Through a program called the Oregon Plan for Salmon and Watersheds, watershed councils and forest landowners identify stretches of rivers and streams that could benefit from improvements such as placing large wood in streams, fixing old culverts and stream crossings that block fish from passing, and moving or decommissioning roads. Unlike laws that only regulate forest practices, watershed councils look at streams from top to bottom, and focus public and private investments on proactive improvements. Threatened and endangered species get special protections in Oregon’s forests. Threatened species are those that are likely to become endangered in the foreseeable future unless conservation measures are taken. Endangered species are those in danger of becoming extinct within the foreseeable future throughout all or a significant portion of their range. In addition to federal protections, the Oregon Forest Practices Act has rules aimed to protect threatened and endangered species that live in Oregon’s forests. OFRI’s Wildlife in Managed Forests program provides tools to help forest landowners protect threatened and endangered species. To learn more, visit KnowYourForest.org. The bald eagle is a good example of successful efforts by federal and state agencies, as well as private forest landowners and managers, to protect a threatened species. The bald eagle was once threatened, but has since been removed from the federal and state endangered species lists. This means the bald eagle population has recovered enough that special protections are no longer warranted. However, here in Oregon nesting bald eagles are still protected during timber harvest activities. All active nest trees are preserved and buffered by other trees to ensure bald eagles have places to nest and raise their young. Learn more. What about the northern spotted owl? Northern spotted owls, which live in mature forests in Oregon, are listed as a threatened species. Among the challenges for northern spotted owls is competing with the barred owl, a very similar species, for space and food. The barred owl is a nonnative species that has been out-competing northern spotted owls in many parts of Oregon. What is being done to help the owls? There are lots of studies and actions being taken by the U.S. Fish and Wildlife Service that are aimed at aiding survival of the northern spotted owl. In addition, all timber operations in Oregon are done in a way that protects the threatened owls. Learn more. 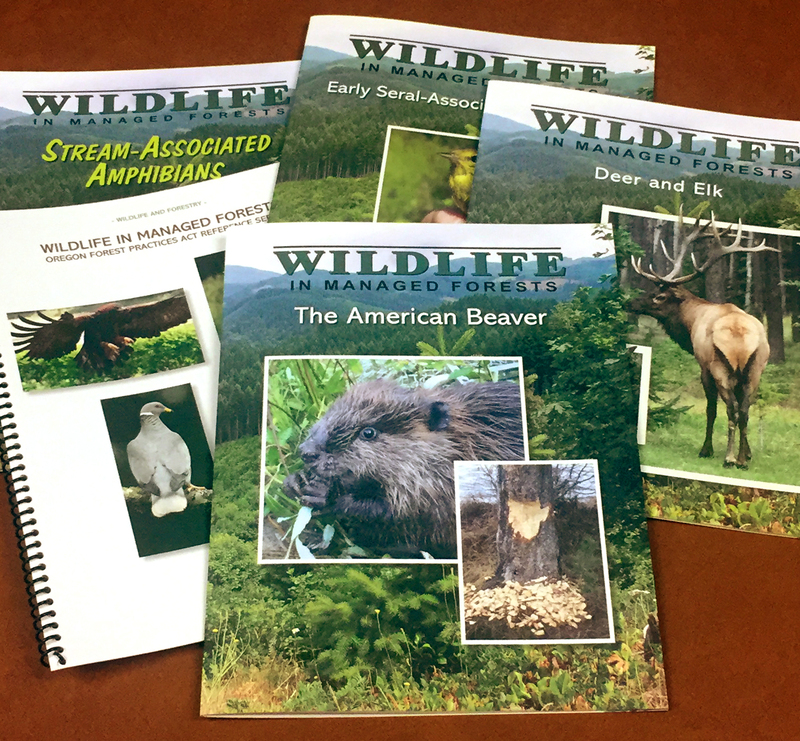 OFRI’s Wildlife in Managed Forests program aims to synthesize current research regarding forest wildlife and make that information available to landowners, field practitioners in forest and wildlife management, and others.